Ever want to work out your personal income tax according to the ATO's individual income tax rates (scales or brackets) in order to determine how much your net salary is? You can use this FREE Australia Personal Income Tax Calculator to work out your total tax, Medicare Levy, etc. You can customize this calculator when each new financial year starts by changing the tax rates which are easily to get from ATO website. 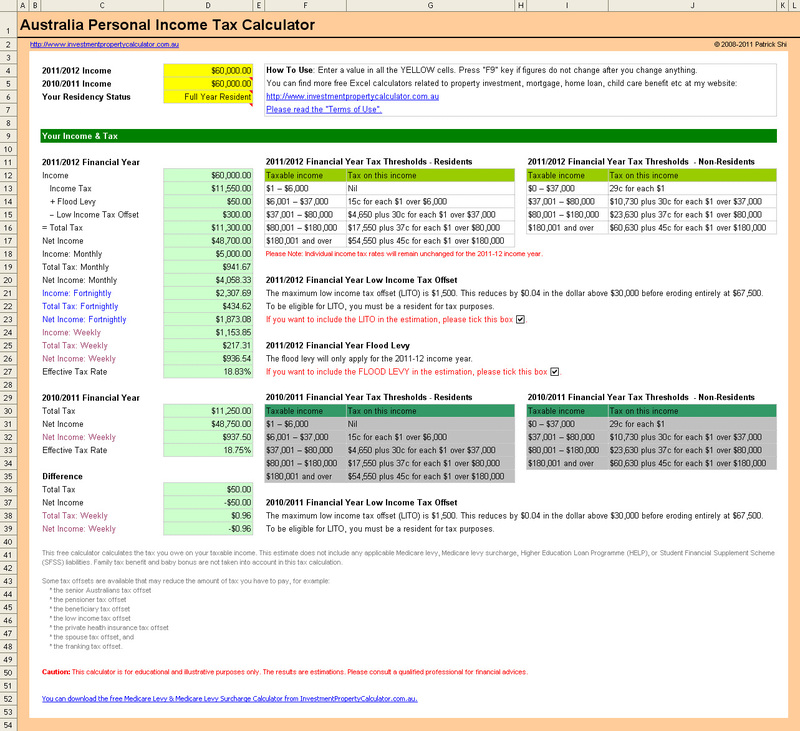 This FREE Australia Personal Income Tax Calculator spreadsheet in Excel allows you to do your personal income tax calculation whether you are a full year resident, a full year non-resident, or a part year resident. In addition, this Australian income tax calculator spreadsheet estimates your annual tax, monthly tax, fortnightly tax, weekly tax, and effective tax rate (average tax rate). You can also compare your current financial year's individual income & tax to last year's. This free Australia Personal Income Tax spreadsheet not only calculated your income tax, it also estimates your low income tax offset (LITO) if you are eligible. You can choose to include or exclude the LITO. This free individual income tax calculator Excel spreadsheet in addition can estimate income tax for non-residents and part-year residents across different financial years. Here is a screen shot that will give you a better idea that what you need to do and what this free Personal Income Tax Calculator can tell you. If you just want to know the individual income tax rates, you can use this Excel spreadsheet as a reference because all the income tax brackets are from ATO's website and they are up to date. Do you know that if you buy an investment property you can use it as a method to offset your income tax which means you get tax deductions? You can download the Free Investment Property Calculator to manipulate how much tax deductions you can get back from ATO. Do you have or plan to have a mortgage or a house loan? You can try the Free Home Loan Repayments Calculator and the Free Home Loan Mortgage Amortization Calculator. Download FREE Australia Personal Income Tax 2019 Calculator (2018-2019 financial year)! Download FREE Australia Personal Income Tax 2018 Calculator (2017-2018 financial year)! Download FREE Australia Personal Income Tax 2017 Calculator (2016-2017 financial year)! Download FREE Australia Personal Income Tax 2016 Calculator (2015-2016 financial year)! Download FREE Australia Personal Income Tax 2015 Calculator (2014-2015 financial year)! Download FREE Australia Personal Income Tax 2014 Calculator (2013-2014 financial year)! Download FREE Australia Personal Income Tax 2013 Calculator (2012-2013 financial year)! Download FREE Australia Personal Income Tax 2012 Calculator (2011-2012 financial year)! Download FREE Australia Personal Income Tax 2011 Calculator (2010-2011 financial year)! Download FREE Australia Personal Income Tax 2010 Calculator (2009-2010 financial year)! Download FREE Australia Personal Income Tax 2009 Calculator (2008-2009 financial year)!